Roller derby has always been known for being popular with lesbians (thanks Ellen Page), but 2018 is the year it’s turning super gay. In February, the Roller Derby World Cup aired on BBC Sport for the first time and now a group of queer women and non-binary skaters are turning their love for the sport into a new live theatre piece. 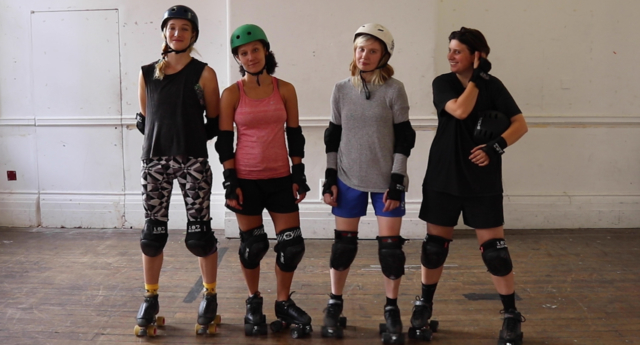 Built on “sweat, speed and female-led ownership,” Skate Hard, Turn Left is a new collaboration between theatre makers and London Rollergirls skaters. Yasmin Zadeh, who is an actor with London’s Queer House agency, is non-binary and got into roller derby through rehearsing for the upcoming show at Battersea Arts Centre. “For me, skating is really interesting because you’ve got to use your full weight on other people and that contact is actually quite unnatural in everyday life,” they told PinkNews. “Roller derby is a really full contact sport so you’ve got to use your whole body and weight to score points. “It’s amazing because it’s got one of the most progressive trans policies of any sport. “Roller derby is a queer community because it’s a space that is not dictated by the male gaze,” she told PinkNews. “For me, that feels very liberating, physically and mentally. Skate Hard, Turn Left is directed by Jemima James​ and runs from October 9 to 13 at London’s Battersea Arts Centre.